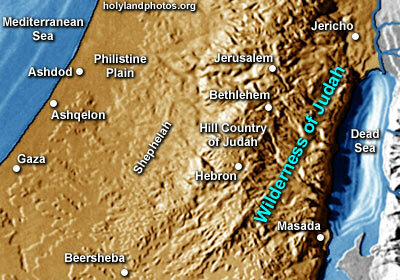 The Wilderness of Judah is located east of the Hill Country of Judah – that is east of Hebron and Jerusalem. This area overlooks to Rift Valley (Dead Sea) to the east. It does not receive much rainfall. It is composed primarily of infertile Senonian Chalk with some deep west to east flowing valleys. During the winter months, the wilderness usually has a light covering of green grass, and is used to pasture sheep and goats. It is about 60 mi. [96 km.] long and 10 mi. [16 km.] wide.